Sunday Mba, a Nigerian Legend, did what JJ could not do. Sunday Mba's two major accomplishments for Nigeria are winning a Nations Cup (which Jay Jay did in 1994), and scoring in a Nations Cup final (which Jay Jay did in 2000). Unless .... did you accidentally write "JJ" where you meant to write "Kanu"? Sure, Kanu is one of the most talented players to ever wear an Eagles jersey, and is a wonderful human being in general .... but you did mean to write "Kanu" there, right? Mba LED us to a trophy. JJ did not. He was a role player in 1994 Stars were Yekini, Amo, Amunike, Oliseh, Mutiu. We did not win in 2002 with JJ as leader and senior player. Up Sunday Mba! Up Naija! Bros, Even Mba go vex for this your statement. It saddens me that JJ has be reduced to half time act and entertainer by Fifa. Zindane, Figo, Rivaldo were Okocha's peers. They can all do acrobatics and tricks as well, yet when Fifa invites them to an event they are treated as dignitaries while they send JJ to entertain the with acrobatics like he is doing above. I protest! Jay Jay, The man, The Legend. Book coming soon. So great he didn't score a Nations Cup goal? Or did Kanu LEAD us to a trophy? Anyway, Sunday Mba was a role player too. This may come as a shock to you, but all 11 players on the field are role players, and even the goalscorers are able to score only because other players create the conditions from which they score. Even a "self-assisted" goal like Mba's was possible (a) because the ball was in the Burkinabe danger area to begin with, thanks to his teammates; and (b) a different Eagles player took a shot on goal that was deflected by a Burkinabe defender into the path of Mba's run. I am sure you join me in thanking all the role-players who played-a-role in winning our three Nations Cup trophies. When is Yobo going to be recognized by Rivers state football association much less of FIFA? Last edited by 1naija on Tue May 16, 2017 3:18 pm, edited 1 time in total. 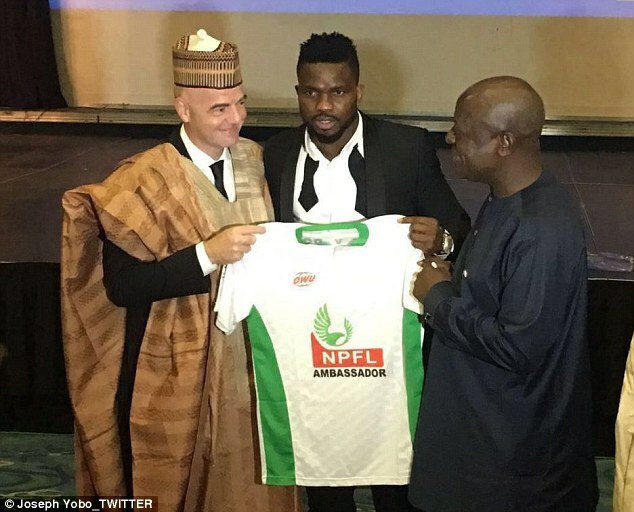 Who do you think is that in the picture that's ecstatic to be in the same space with Yobo? my fren, has Captain Yobo ever lifted ANC, like the great captains such as CCC and Keshi? Fifa President during his visit to Nigeria no be the same as FIFA recognizing One player as a Legend Worldwide.....all the way in kazan.